Proseccos have become my go-to bubbly for most everyday occasions. And with most Proseccos priced under $25, you really can’t go wrong. They are crowd pleasing wines, refreshing, light and crisp. I love them with raw oysters, most starters, shellfish and seafood, and on most days when the temperature is above 80 degrees. This Prosecco from Candoni is a solid Costco buy. 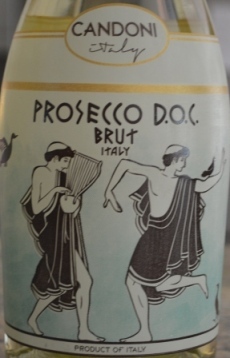 Similar to their Moscato I recently reviewed, the Prosecco is also priced at $9.99 which is very low. Search online and most online outlets sell the wine for $14.99. But we expect a good price from Costco, so let’s look at the wine. This is a clean, easy drinking Prosecco, dry with medium acidity. Flavors of peach, pear and apple. One of the better Proseccos we’ve tasted from Costco lately in the $10 range. And that label is unmistakable.